The bi-annual Professional Lighting Design Convention was created for the global lighting design market. Lighting designers, architects, researchers, universities, industry and other clients use the event as a platform to meet, learn about the latest developments in lighting design, and discuss the future of the lighting profession. Typical for the PLD concept are the ‘warm-up events’ that are held in the time in between the individual events to warm-up lighting professionals. Over the years, PLDC has registered altogether almost 5,000 attendees. 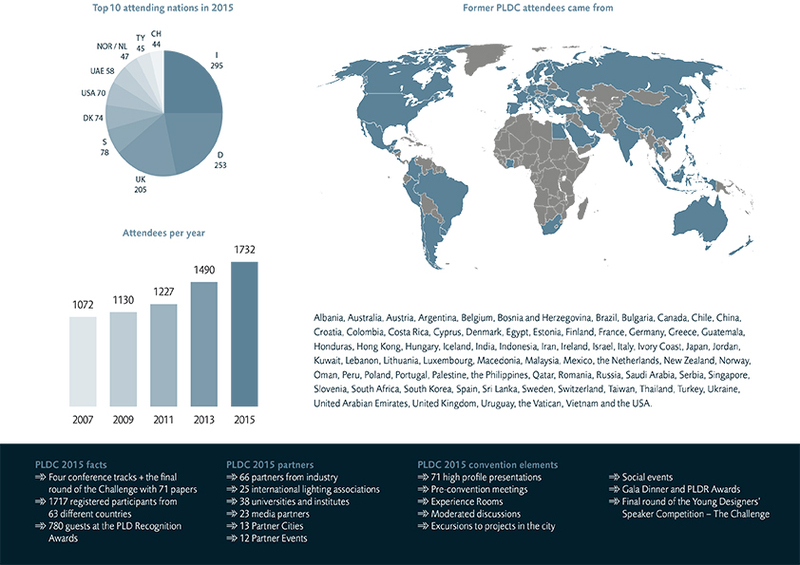 PLDC – Facts & Figures past editions. Source: PLD website. PLDC events, designs and excursions for Lighting Design Professionals. The next edition, PLDC 2017, will take place in Paris, France, under the motto “Shift Happens”. Based on the successful proven concept, PLDC will again be built around a three-day professional conference offering approximately 70 presentations given by high-profile speakers. Location will be the Palais des Congrès de Paris (2nd level), a leading venue for conferences, trade shows, corporate events and shows. Combining architectural innovation, international fame, a strategic location with easy access and a large hotel capacity, this venue has the advantages of one of the world’s largest convention centres. It fits perfect to the architecture and design minded PLDC visitors! Pictures at this page are courtesy of PLD/Via-Verlag. The bi-annual Professional Lighting Design Convention (PLDC) was created for the global lighting design market. Designers, lighting architects, researchers, universities, industry and other lighting professionals use the PLDC event and conferences as a platform to meet and discuss the future of the lighting profession. With the latest lighting design products and trend on display, it is a must-see event for lighting professionals. The PLDC event offers a transfer of high quality knowledge and international networking opportunities.